Powers/Abilities: The Conquistador used a "kinetic trident" from which he could discharge powerful electrical blasts. He used a shield, also charged with electrical energy, which could repel assaults with the force of a ten-ton truck. He wore chain mail body armor. His headquarters served both as a hideout and the power source for his electronic arsenal. (X-Men I#52/2 (fb) - BTS / X-Men I#53/2 (fb) - BTS) - The Conquistador planned to take over the world by threatening every capitol with destruction via the giant power transmitters in his fortress. As a power source, he sought an experimental nuclear reactor/solar generator, but he lacked the means to sneak into the tightly guarded base and escape with it. (X-Men I#50/2) - From a distance, the Conquistador, along with Chico, watched with interest as high school football star Hank McCoy stopped a trio of criminals robbing his football stadium. The Conquistador described him as the final tool he needed for his onslaught...who would make him master--of all! 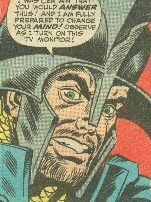 (X-Men I#51/2) - Conquistador instructed his men to capture McCoy. (X-Men I#51/2 - BTS) - The Conquistador's men kidnapped Edna and Norton McCoy. (X-Men I#51/2) - After Hank escaped being run down by a car, the Conquistador instructed them to execute Operation: Snare; though Hank dodged their net and toppled two of the agents, the Conquistador then appeared and stunned him with an electrical blast. (X-Men I#52/2) - The Conquistador and his men brought McCoy back to their base. (X-Men I#51/2 / X-Men I#52/2) - The Conquistador showed Hank that he held his parents hostage; their lives would be forfeit if he refused to aid the Conquistador. At the same time, the X-Men, who had been tracking down McCoy, realized that he was missing, and so they went after him. (X-Men I#52/2) - After Hank agreed to his demands, the Conquistador sent him to a laboratory where he stole an experimental nuclear reactor/solar generator, which would grant the Conquistador with "fantastic amounts of electric energy within astounding limits of space and weight." 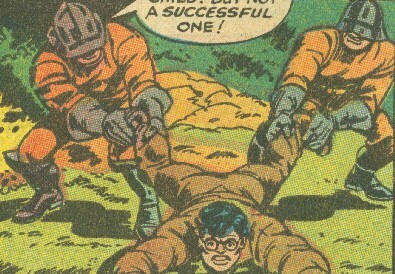 Narrowly escaping the government troops guarding the device, Hank brought the device to the Conquistador, who nonetheless refused to free him or his parents, telling Hank he would be his servant until he was of no further use; to punctuate his point, the Conquistador slapped Hank to the floor. Meanwhile, having tracked Hank via Xavier's newly developed Cerebro, the X-Men prepared to come to his rescue. (X-Men I#53/2) - Via the experimental nuclear reactor/solar generator, the Conquistador prepared to project devastating energy across the planet, after which all governments would surrender to him and he could conquer the world. Recovering, Hank forced his way past Chico and rushed the Conquistador, who repelled him with his shield and then kept him on the defensive with electrical blasts. Hank was stunned when a door through which he intended to escape slammed shut suddenly, but as the Conquistador threatened to finish him off, the X-Men came to the rescue. Hank joined the X-Men in making quick work of the Conquistador's men, but the Conquistador himself then activated the stolen device. However, the energy from the device failed to enter the transmitters, instead pouring into the Conquistador himself. The Beast escaped with the X-Men and his parents just before the Conquistador's fortress exploded. After this, the Beast accepted the X-Men's offer to join their team. Comments: Created by Arnold Drake, Werner Roth, and John Verpoorten. As the X-Men rendezvoused with Professor X, he told them that he had used his telekinetic power to alter the device's circuitry. That's interesting, because Xavier is a telepath without telekinetic powers. I think he could have easily used his telepathic powers to force the Conquistador to alter the device's circuitry, OR perhaps he was using an experimental device that briefly granted him telekinetic powers. 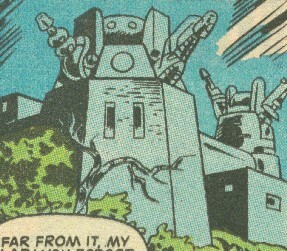 In X-Men I#52/2, the stolen device is an experimental nuclear reactor; in X-Men I#53/3, it's a solar generator. Perhaps it is a nuclear reactor which generates energy equivalent to the raw heat and radiation of the sun. This story was later retold in X-Men Origins: Beast (November, 2008). Conquistador has an entry in Marvel Legacy: The 1960s Handbook. In his OHotMU A-Z Hardcover#3 entry his real name was revealed. 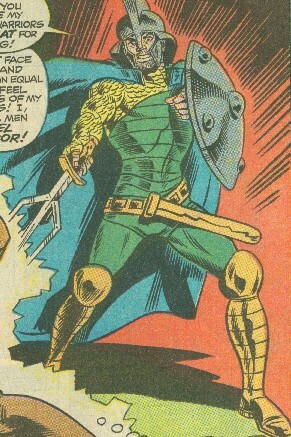 The Marvel Index to the Avengers notes in the entry for New Avengers I#18, that the non-mutant Furio Conquistador is erroneously depicted instead of the mutant Conquistador, Miguel Provenza, who was actually meant to be among the depowered mutants, whose energies were absorbed into the Collective. Conquistador (Miguel Provenza) - mutant, former racketeer in Spain, battled el Aguila, aura disrupted by him. The Conquistador's loyal servant, he served to run errands and stroke the Conquistador's ego. They captured the Beast's parents, but were unable to stand up to the Beast himself, with or without the X-Men helping him. Armed in light armor with helmets, they carried energy weapons. Somewhere outside Dunfee, (Illinois? ), it served both as a hideout and the power source for his electronic arsenal. It was destroyed by the experimental nuclear reactor/solar generator. It had a few trap sliding doors to prevent others from escaping or to allow his men to enter on command. It was kept at a laboratory under supervision by government troops until stolen by the Beast for the Conquistador, who planned to use it to project devastating energy across the planet, after which all governments would surrender to him and he could conquer the world. Its circuitry was altered, and when the Conquistador activated it, it sent its energies into him instead, presumably killing him and blowing up his base.